Thomas Alva Edison (February 11, 1847 – October 18, 1931) was an American inventor and known as the Wizard of Menlo Park. Edison's favorite invention was the phonograph. In 1877, he created a way to record sound on tinfoil cylinders by using two needles, one for recording and one for playback. The first words that Edison recorded were "Mary Had a Little Lamb." Ten years later, in 1887, Edison formed the Edison Phonograph Company to sell the phonograph to the public. This marked the beginning of the sound recording industry. 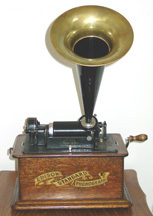 The first records sold by the Edison and Columbia Phonograph Companies were on wax cylinders. These were brittle and broke easily. Columbia ceased production of wax cylinders in 1909 when discs became popular. 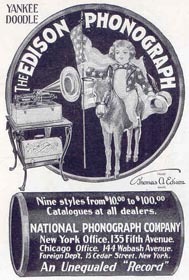 The Edison National Phonograph Company continued making cylinders and discs until 1929. Cylinder records and other recordings made throughout the twentieth century are valuable primary resources.For the first time in political history, candidates in the 1908 presidential election (William Howard Taft, Republican and William Jennings Bryan, Democrat ) recorded speeches that were sold to the public. Theodore Roosevelt also recorded speeches. Many institutions such as the Smithsonian and Library of Congress are trying to preserve recordings such as these under a program called Saving America's Sounds. To learn more about Thomas Edison and listen to early recordings, visit the Websites listed at the bottom of the page. Edison Cylinder Samples is an iBook available for free. It provides some examples of the various types of recordings with lillustrations from advertisements and performers. 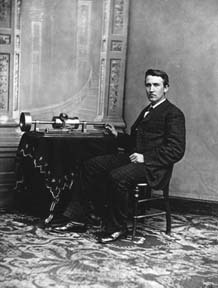 CREDIT: Edison, Thomas A.. "Edison with Cylinder Phonograph; Washington, DC; April 18, 1878." 1878. Photo courtesy of U. S. Department of Interior, National Park Service, Edison National Historical Site. 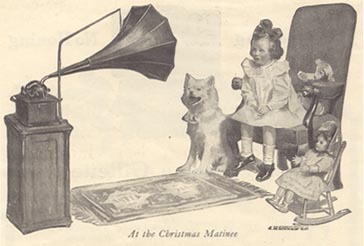 In 1890, Edison introduced the first talking doll that contained a six-second recording of a nursery rhyme. Children were expected to turn a tiny crank at a constant speed in order for the cylinder to play. Needless to say the doll was a failure and only available for a short period of time. 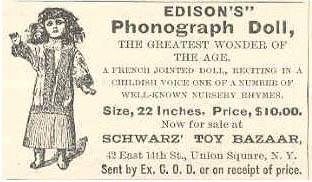 To hear a recording and read more about the history of the Edison Talking Doll, visit these Websites. Listen to a description of the doll and one of the recordings at this museum exhibit. View original illustrations of Edison's Talking Doll and the mechanism that was used to play the recordings. Listen to one of the spoken recordings from Edison's Talking Doll - Little Jack Horner in a variety of audio formats. Carboard tubes were used to package and protect the cylinder records. Each record company made their own generic labels for the boxes. There was no information on the label to identify the contents. Thus, a record slip was included inside the box. A slip of paper to identify the recording and performer was placed inside the box with the cylinder. At first this information was hand-written or typed on each slip, but printed versions became more common once cylinders were sold in large enough quantities to justify the printing set-up cost. Directions: Listen to one of the cylinder recordings. Using the guide below, describe what you hear. Describe what you hear in the recording by investigating its parts. For example: Is the recording musical or nonmusical? Are there any recognizable instruments? If so, identify them. Are the words sung or spoken? Is there any slang or dialect used in the recording? Is a story being told? If so, what is the story about? What was happening in history during this time period? Did history or culture have any influence on the words or music? Describe your personal feelings and what you think about the recording. Always base your subjective reaction on something that is heard. For example, "I heard ..., and it makes me feel or imagine ..."
Do you have any Questions about the recording? 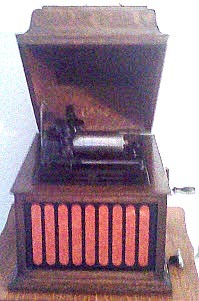 The cylinders were played on either an Edison Standard Phonographor or an Amberola 30 and recorded using Garage Band on a MacPro. The files were edited in Audacity. These recordings are from the author's collection. Please do not upload these files to other sites without attribution. The melody originated with a Lithograph created by Currier and Ives. Visit this Cyberbee researched page to learn more about early artists who recorded for the major record comapnies like Edison, Columbia, and Victor. Geoffrey O'hara recorded Navajo Indian songs, Edna Bailey told bedtime stories, Harry Humphrey recited famous speeches, Ada Jones and Billy Murray were popular singers, Christine Mille demonstrated tone tests and sang beautiful songs. Cal Stewart enterained audiences with his Uncle Josh stories. Discover these "Oldies, but Goodies" and teach music using primary sources. Language laboratories were made possible by Thomas Edison's invention of the tin foil phonograph in 1877. Learn about the earliest foreign language instruction recorded on cylinders. Listen to samples from French, German, Italian, and Spanish cylinder records. There are also images of the cylinder containers and some early advertisements. In 1939, Gone with the Wind was released and considered one of the greatest films of all times, David O. Selznick produced the movie based on Margaret Mitchell's novel. Max Steiner provided the musical score that contained original music such as Tara's theme as well as preexisting traditional music such as My Old Kentucky Home. A number of ethnographers recorded the stories, music, and traditions of Native Americans. Among these ethnographers were Francis La Flesche from the Omaha Tribe, Alice Cunningham Fletcher, Edward S. Curtis, Frances Densmore, Melville Jacobs, and Gertrude Bonnin also known as Zikala-Sa, a native Sioux. On this page are short biographies, locations housing these cylinder treasures, and a few recording samples. There are several digitization projects in the works to preserve these historical artifacts. The Belfer Cylinders Digital Connection provides online access to digital audio files of cylinders in the Belfer Audio Archive. Belfer's cylinder collection includes over 22,000 cylinders, 12,000 of which are unique titles. With funding from the Institute of Museum and Library Services, the UCSB Libraries have created a digital collection of nearly 8,000 cylinder recordings held by the Department of Special Collections. In an effort to bring these recordings to a wider audience, they can be freely downloaded or streamed online. The online catalog can be easily searched by keyword. The archive at Edison National Historic Site includes approximately 48,000 disc and cylinder records produced by Edison in West Orange, New Jersey, between 1888 and 1929. Many of these, including unreleased and experimental recordings, have been at the Laboratory since Edison's lifetime. Ranging back to the first years of the invention and development of the phonograph, some of the earliest examples of recorded sound in existence are preserved within this unique collection. This site contains a compilation of selected recordings arranged by genre such as comedy sketches, documentary and political speeches, and popular songs. This site features 81 disc sound recordings, and other related materials, such as photographs and original magazine articles. 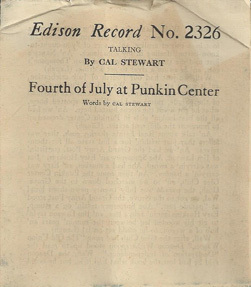 In addition, histories are given of Edison's involvement with sound recordings, as well as a special page focusing on the life of the great inventor.